Publisher, bibliographer, and editor; born at Kammin, Prussia, Aug. 23, 1800; died at Venice, Sept. 1, 1853. He was destined for a commercial career, and was sent for this purpose to England. He settled afterward as a jewelry merchant at St. Petersburg, Russia; but on one occasion he happened to buy an old library. This decided his later career. He gave up his former business and devoted himself entirely to bibliography and publishing. In 1830 he removed to Berlin and established himself as a book-seller and publisher; in the former capacity obtaining the valuable agency for the purchase of foreign books for the British Museum. A branch of the firm was accordingly established in London. It was through the influence of Asher that Joseph Zedner was appointed curator of the Hebrew books of the British Museum. 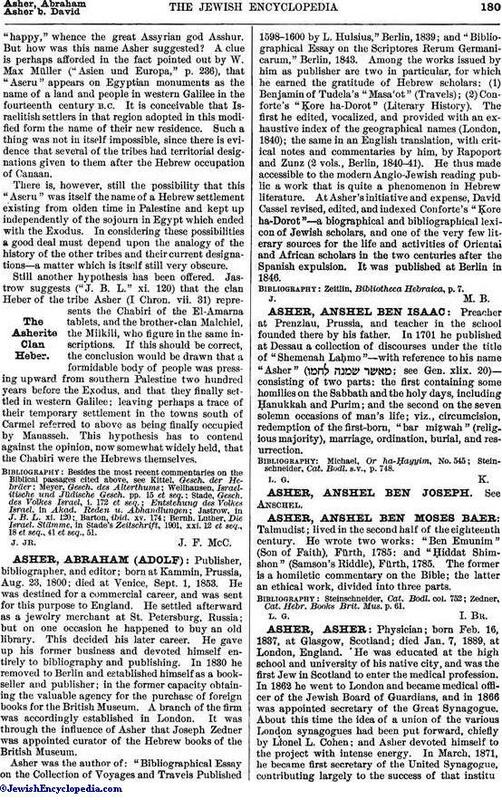 Asher was the author of: "Bibliographical Essay on the Collection of Voyages and Travels Published 1598-1600 by L. Hulsius," Berlin, 1839; and "Bibliographical Essay on the Scriptores Rerum Germanicarum," Berlin, 1843. Among the works issued by him as publisher are two in particular, for which he earned the gratitude of Hebrew scholars: (1) Benjamin of Tudela's "Masa'ot" (Travels); (2) Conforte's "Ḳore ha-Dorot" (Literary History). The first he edited, vocalized, and provided with an exhaustive index of the geographical names (London, 1840); the same in an English translation, with critical notes and commentaries by him, by Rapoport and Zunz (2 vols., Berlin, 1840-41). He thus made accessible to the modern Anglo-Jewish reading public a work that is quite a phenomenon in Hebrew literature. At Asher's initiative and expense, David Cassel revised, edited, and indexed Conforte's "Ḳore ha-Dorot"—a biographical and bibliographical lexicon of Jewish scholars, and one of the very few literary sources for the life and activities of Oriental and African scholars in the two centuries after the Spanish expulsion. It was published at Berlin in 1846. Zeitlin, Bibliotheca Hebraica, p. 7.